Ah…spaghetti squash! It’s simple, it’s tasty, it’s pretty, it’s easy, and it’s only 40 calories per serving (one cup). It is also a great substitute for traditional pasta. Imagine being able to feel full and satisfied without feeling bloated much like with traditional pasta. 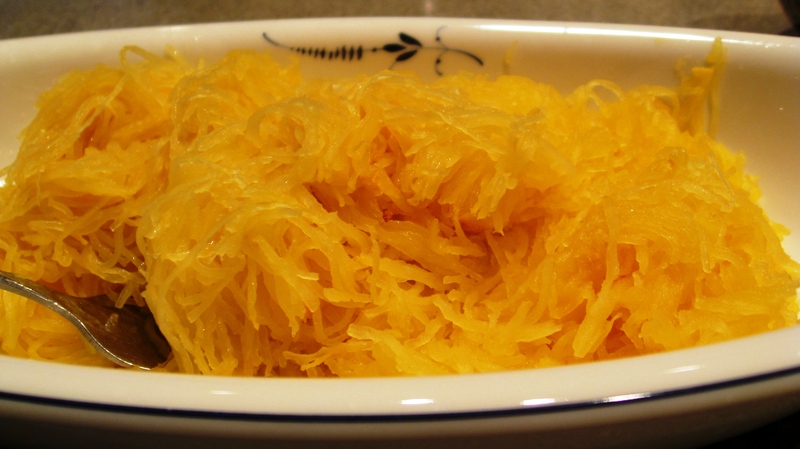 There are many different ways that spaghetti squash can be seasoned, experiment with it and have some fun. Our recipe here is a very simplistic line up of flavors – have a look and try it! Preheat oven to 350 °F. Cut squash in half, long side and scoop out all seeds then place onto a baking sheet. Sprinkle with sea salt, cayenne or pepper, nutmeg and place ½ tbsp of ghee in each squash half. Once the ghee has melted, distribute evenly with a brush. Bake for about 30 minutes or until tender. With a large serving fork scrape from side to side (u-shape) so to make sure that you don’t destroy the noodle like fringes. We love it as a pasta substitute or just as a super low-calorie, but filling side dish.